We have our standbys in Wellfleet. We start at Arnold's for the fried shrimp, steamers and heaps of onion rings. Mac's offers scallop burritos and a view. PB Boulangerie means rich breakfast each morning. And the Wicked Oyster is sufficient for that one nice dinner. But each year I am on the lookout for some place new. 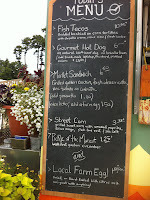 And this year it was a food truck of all places, set right on Route 6 after the Wellfleet Post Office and before PJs. The Sunbird Food Truck is having its first summer as a fast "slow food truck." And, it is absolutely my style of food: local, fresh and with a menu that changes daily depending on what is available. Each time I drove by, I longed for the Slow Roasted Porchetta sandwich. Of course, on the one day I went, the porchetta wasn't available! But I was saved by the recommendation of chef and co-owner, J'aime Sparrow who led me to the market sandwich. On that day, the sandwich had fresh grilled zucchini, tomato, greens, proscuitto, a fried egg and, the best part, citrus ricotta. Together the citrus was the best compliment to the rich sandwich. 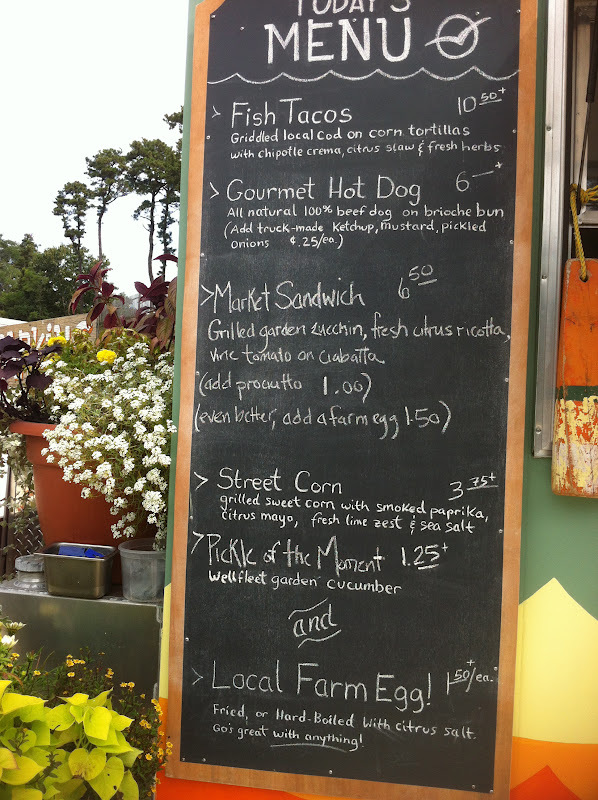 Other treats included a gourmet hot dog on brioche or fresh fish tacos. I could have taken the sandwich to the beach, but my impatience got to me and I shared one of the tables that sit alongside the truck. I didn't want to keep J'aime and her crew from cooking for too long, but in a brief interaction I learned that she had spent 10 years in San Francisco before heading back to the east coast to open the truck with her husband, Christian. The truck is currently open Wednesday through Sunday from 10 to 3. As for the porchetta, her plan is to try to have it on Thursdays and Fridays.